I have just added the screencaps for One Last Shot to the episodes' page. Officer Joe Landers is suffering from alcoholic dependancy. Following a robbery in a local market, Landers and his veteran partner, Mel Shaffer, chase a suspect whose car seems to match the description provided by police headquarters. Under the influence of the cheap booze he consumed in a rest room a few minutes earlier, Landers manhandles the suspect and draws his gun. The suspect, Robert Graves, tries to make him take the gun down, and in the following close fight, the weapon goes off and Landers' partner is shot. Knowing the situation would get into a 'a former crook's word against a cop's word', Graves knocks down benumbed Landers and escapes. Little does Landers know that two eye-witnesses observed the situation, and his old friend's widow does not seem to have faith in him neither - nor does Corky Shaffer, Mel's son who also serves as a police officer. When Mike and Steve turn their focus onto a possible killing by a drunken cop, paranoia adds to Landers' symptoms, resulting in attempts on the lives of our two cops as well. 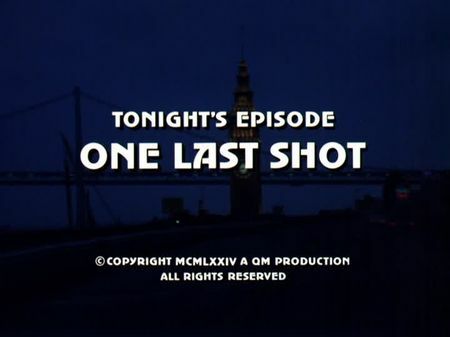 This episode's opening scenes were all filmed between Inner Richmond, Laurel Heights, and The Panhandle, including the chase and shooting between Landers and Graves. For the characters' homes, the film crew moved over to Dolores Heights, where not only Officer Shaffer's and Joe Lander's homes are located but also the house of suspect Robert Graves and his pregnant wife (their neat house, however, was demolished in the meantime). They also used to film several sequences on the SFPD headquarters' former parking lot and inside the lobby on Bryant Street, whereas Graves' interim hideouts (the first one being where Landers erroneously shoots at Steve, and the second one where Graves meets his brother) were located in the Western Addition. His paranoia finally leads drunken Landers to the skidrow part of Embarcadero underneath the elevated freeway between Mission and Howard Streets before he shoots on Mike Stone in his homicide bureau.